Husqvarna Vitpilen 401 and Svartpilen 401 are two latest bikes in India. This article will provide you information like bike features, price, launch date, availability and a complete review for your knowledge. Husqvarna is a KTM based motorcycle company which has its original roots in Mattighofen, Austria. The current production of Hasqvarna bikes are done here. However Husqvarna is planning to launch two of its 373.33 cc bikes in India. Thus the manufacturing unit would be shifted to Bajaj Chakan Factory, Pune by end of 2018. Although the company had plans to conduct the launch in early 2018, but due to some reason it had to be postponed. Also Vitpilen 401 and Svartpilen 401 had already been spotted in Pune. It is said that these bikes were getting checked for its performance in Indian road and traffic. Thus we can expect an early launch of these bikes in 2019. The names of these bikes are taken from the Swedish words Vitpilen meaning 'white arrow' and Svartpilen meaning 'black arrow'. The naked single body of these beasts is a refreshing new design that does rightful justice to their names. The frame of these bikes is similar to the duke series lineup whereas the engine and the brakes in these bikes are that of the duke 390. Also because of its moderate price as compared to other sports and café racer bikes, it will give a good competition to other companies. These two models have most of its mechanical parts same as that of KTM 390. However the design of these two bikes are totally different. 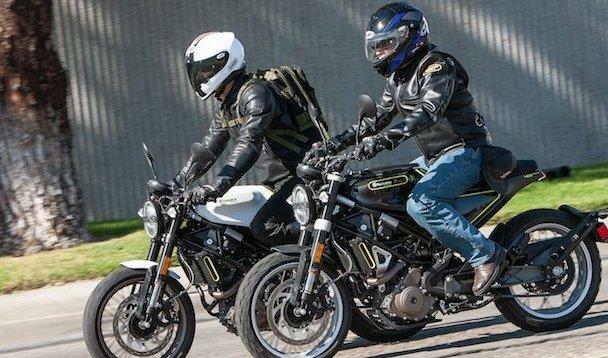 Vitpilen 401 have a café racer look whereas Svartpilen got scrambler look. The handles are designed accordingly to ensure this look. The power is decent enough to move around the city very smoothly. Moreover, you won't find the trouble cracking the sharp turns. The handling of these bikes is pretty smooth. You won't find much of vibrations. Also these bikes look small and it does suit average height riders. Vitpilen have a café racer look which makes the biker bend ahead a little because of its handle bars whereas Svartpilen have street scrambler look wherein you will find handle bars heights as compared to former. Vitpilen and Svartpilen weighs around 339 lbs and 343 lbs which makes them a light weight motorcycle. This gives a good handling experience at the corners. 150 mm rear tyres helps you to bend more which add helps you in turns. Thus, it improves maneuvering of bikes. The looks of these bikes are incredible. It provides an expensive texture on the body. The gold Husqvarna logo on engine is an add on to its beauty. The fuel tank has side bulges over which 'Husqvarna motorcycles' is printed. The naked body is something which makes it different from KTM Duke 390.